I would ever need one of these? Well, my furry pal, Lola, and I went visiting yesterday to my good friend Denise's house to meet the newest addition to their family. 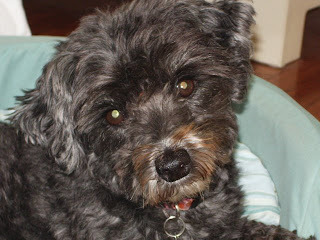 Cookie, a Malti-Poo puppy. We thought it would be so nice for Lola and Cookie to become friends. Well, not only was Lola less than patient with the pup (a tad snippy, actually), but she went No. 1 on a cool, round mattress that D has (of course, it was new). 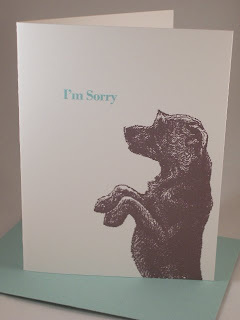 So, not only will I be replacing the mattress, but sending this apology card. I designed it last summer when I found the dog graphic and thought it was hilarious. Who knew it would come in handy! I hope it's the last time I have to use it. That's a cool card though. That is one great card!! Surely she will sign it herself, no? There was a small paw print in the card and I spelled out "lick, lick" for her.